I share our family car with my husband. He works 12 hour shifts 3/4 days per week and to be honest in the holidays when faced with the option of getting the kids out of bed at 7am and driving hubby to work or us having a lie in until 9am you can guess which option we've been choosing! This does leave us with no car through the day though and those who know me will know I am not one for sitting in the house! Luckily, Manor Walks in Cramlington is just a 15 minute walk from our house and a perfectly manageable walk for my 4 year old. We have spent quite a bit of time here over the Summer whether this be Kids AM movies at Vue Cinema where tickets are a bargain £1.99 each, meeting friends for coffee in one of the many coffee shops or popping in to buy a last minute picnic to enjoy at Seven Oaks park which is just across the road. I asked my children what they wanted to do during the holidays and a trip to Frankie and Benny's in Manor Walks was on the list (as it is every holiday). We hadn't really spent anytime with my mum these holidays so decided to make a day of it and all watch Pixels at Vue followed by tea and Frankie and Benny's. Pixels was actually much better than expected (I wasn't expecting much to be honest and only chose this film as the children really wanted to see it). The whole family enjoyed ourselves, even my mum. It was good, light hearted fun with lots of action. It is a 12A so check film guidelines before you take young children but I didn't find it too violent. The kids are now obsessed with Donkey Kong and Pac Man! After the film we popped a few doors along to Frankie and Benny's which is conveniently close by. I was interested to learn that they have re-vamped their menu with Meatballs Italiano, Roman Smoky Pizzas, New Jersey Chicken and Sorrento Swordfish all being welcome new additions. 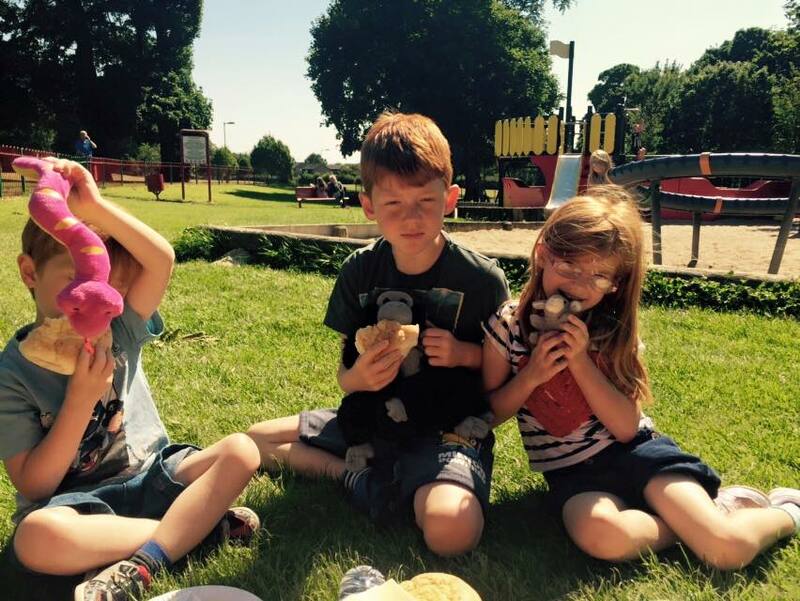 The children's menu remains as good as value as ever with 2 courses, a refillable drink and activity pack for only £4.25. 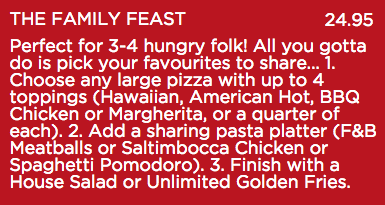 I really like the sound of the new Family Feasts too and I'm sure we'll be back to try one of these soon. The children's activity packs had changed slightly since our last visit and were conveniently 'movie' themed with enough stickers, press outs and games to keep them entertained as we waited for our food. The staff are always lovely at Frankie and Benny's, they were attentive, chatty, friendly and asked if we would like our children's meals brought out with our starters - this always gets the thumbs up from me! Our starters and children's meals were all with us in no time and it wasn't long before we had cleaned our plates. Their portions were more than ample and I was starting to wonder if I would manage my main course (or maybe I shouldn't have eaten so many sweets at the cinema). Our main courses were HUGE and regretfully, my suspicions were correct and I couldn't finish it all. I will definitely order the pitta again though but maybe opt for it with salad instead of chips next time. The sauce had a real kick to it and the bread was lovely and fresh which I mentioned to my mum never seems to be the case when I buy my own Pitta breads for home. 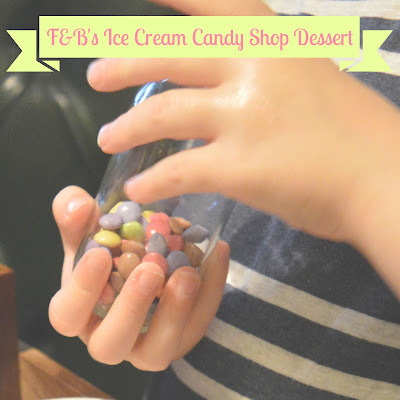 Our children could have ordered an ice cream sundae as part of their £4.25 meal deal but opted to upgrade for and extra £1.95 to the Ice Cream Candy Shop which I have to say is every child's dream and I was a little jealous! You get two scoops of ice cream, three jars of sweeties, a bowl of mini marshmallows, some popping candy and a jug of warm chocolate sauce, plus a sweet shop bag to take any leftover sweets home. Our children thought this was AMAZING and had fun designing their own desserts and names (we chose to call Jack's creation 'exploding chocolate ice' which I certainly think sums the dessert up! 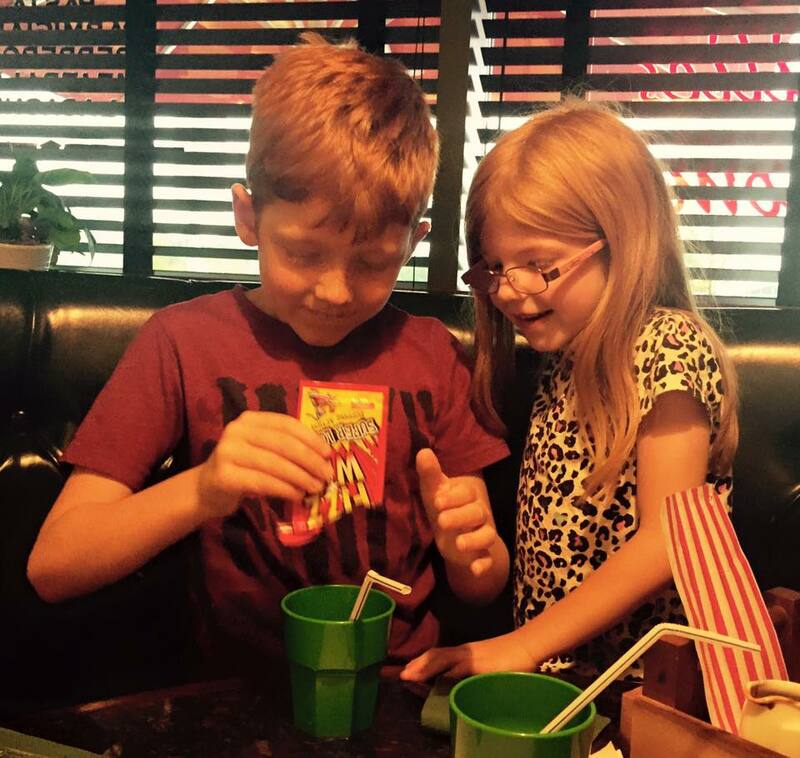 This was the first time our children have tried popping candy and they were amazed - they had to carry out a few experiments of their own whilst we were waiting for the bill including mixing some popping candy with Pepsi! Ah just look at their faces - they are loving it! I feel we will be popping back soon just so we can order this dessert again! We spent a lovely afternoon at the cinema and Frankie and Benny's with my mum - it was lovely to do something that the children really enjoyed whilst we could have a good old catch up before our holidays. On a final note - Have you joined F&B rewards? Sign up here to receive money off vouchers, a voucher for KIDS TO EAT FREE on Fridays, birthday treats and more. T&C's apply. Have you tried Frankie and Benny's new menu? I'd love to hear what you think. That does look fab, I keep meaning to try the nearest Frankie & Benny's to us, looks like I need to get it sorted! Those potato dippers look amazing! We actually went to the Manor Walks branch for the first time last weekend - somehow my 16 month old daughter's kids meal looked bigger than both adult meals, but we had no problem finishing it for her! Frankie & Benny's is often on the list for our two as well - its a particular hit for birthdays.